Hannan senior Hailey White tips a ball over the net during Monday night’s Class A Region IV, Section 2 volleyball match against Van at Buffalo High School in Buffalo, W.Va.
Hannan senior Jessica Dalton bumps a ball in the air during Monday night’s Class A Region IV, Section 2 volleyball match at Buffalo High School in Buffalo, W.Va.
BUFFALO, W.Va. — If nothing else, the Lady Cats went down fighting. 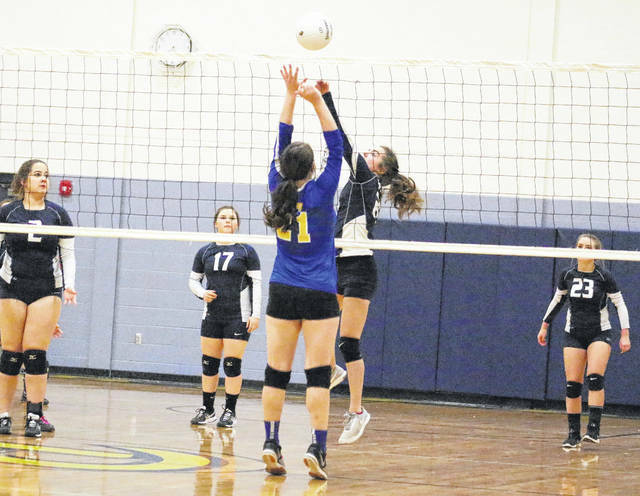 The Hannan volleyball team had its 2017 campaign come to an end Monday night after a pair of losses at the Class A Region IV, Section 2 tournament held at Buffalo High School. The Lady Cats (3-19) — who entered the tournament as a seven-seed in a seven-team bracket — never led in their opening match as Huntington Saint Joseph (20-12) posted a 25-13, 25-11, 25-12 straight-game decision. HHS, however, managed to keep things much more competitive against Van (14-15) before ultimately dropping a 25-19, 26-28, 25-23, 25-16 decision in the eventual season finale. The Lady Cats trailed by at least a dozen points in each of their three games against the Lady Irish, who stormed out to early leads of 4-0, 3-0 and 2-0 in each of those respective sets. HSJ went on to post its largest lead in Game 1 with the final 12-point outcome, then did the same in Game 2 with a 14-point decision. The Lady Irish also led 23-9 in the finale before wrapping up the match with a 13-point win. Pammie Ochs led Hannan with five service points, followed by Halie Johnson with four points and Josie McCoy with three points. Jessica Dalton was next with two points, while Hailey White and Baylee Hudnall each had one point in the setback. Dalton led HHS with three kills, while Johnson, Ochs and Hudnall also added a kill apiece. Johnson also had the team’s lone block. Hannan moved to the loser’s bracket of the double-elimination tournament, where Van — in its first year with varsity volleyball — was waiting. The Lady Bulldogs led wire-to-wire in the opening set and led by as many as eight points (22-14) before claiming a six-point decision for a 1-0 match lead. The Lady Cats secured their first lead of the night with the opening point of Game 2, which ended up featuring nine ties and five lead changes by the end of the set. Hannan built an 18-11 advantage before VHS rallied back to tie things at 24- and 25-all. Van had a game point with a 26-25 cushion, but the Lady Cats answered with three consecutive points to knot the match up at one apiece. The pivotal third game featured nine ties and seven lead changes, and HHS held the largest lead in the set at 16-11. Van took its largest lead at 23-20, but Hannan rallied with three straight points for a 23-all contest. The Lady Bulldogs scored the final two points and took a 2-1 match advantage in the process. Hannan held early leads of 3-2 and 5-3 in Game 4, but Van answered with five straight points and never trailed the rest of the way. The nine-point outcome was the largest lead of the game as Van wrapped up the 3-1 triumph. 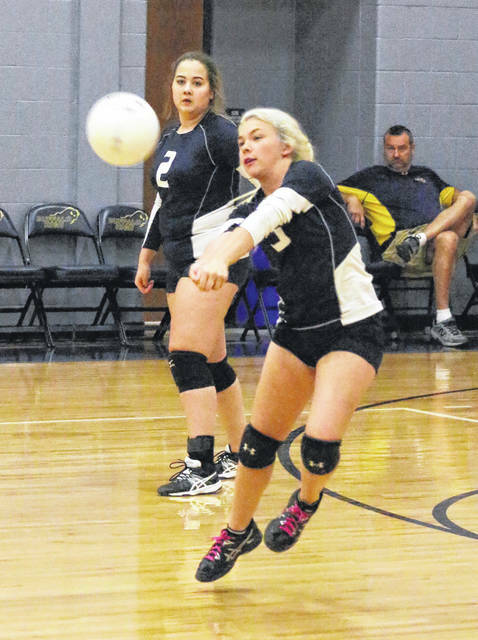 Johnson led the Lady Cats with 14 service points, followed by Ochs with six points and McCoy with five points. Dalton and White each recorded four points, while Hudnall ended the service attack with three points. Johnson led the net attack with five kills and McCoy also had two kills in the setback. Hannan had just seven players available for the postseason run, which included as many seniors as freshmen. 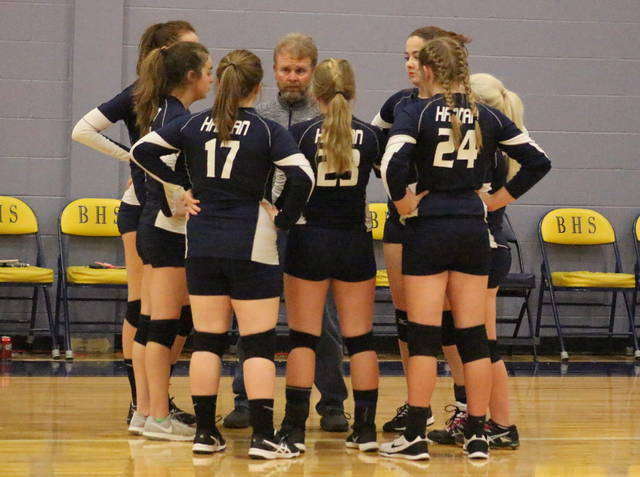 Given the fact that the Lady Cats went through four coaches and had twice as many players at the start of the season than now, HHS coach Frankie Hudnall knew the odds were working against his troops. He, however, also noted that the girls weren’t afraid of the task at hand — and he really admired their courage on Monday night. After going through a winless 2016 campaign, Hudnall was pleased that the girls managed to pick up a trio of victories this fall. The Lady Cats should also have five experienced players returning to the mix next season, but Hannan will have to replace two key veterans in Hailey White and Jessica Dalton. Hudnall acknowledged how much those seniors meant to him — and this squad — this year. Hannan ended the season with seven consecutive defeats.